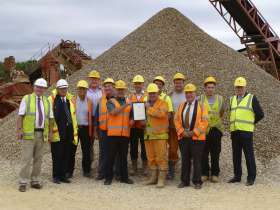 The Cullimore Group of Companies received a British Aggregates Association (BAA) Site Assessment Certificate for their sand and gravel operation at Roundhouse Farm, near Marston Meysey, Wiltshire. The firm was presented with a compliance certificate by former HM Principal Inspector of Quarries, Eric Darlow, who is chairman of the assessment panel that oversees the BAA scheme. We take our responsibilities in this area very seriously and have a very good record. All new employees, agency and temporary workers are inducted into our health & safety culture. Prior to the commencement of work each individual is informed of the particular risks associated with that task, the necessary reporting requirements, operating and emergency procedures. All employees undertake regular training relating to their specific job. We fully investigate all accidents and ‘near misses’. The findings are then used to prevent reoccurrence either by changing working practices, reviewing risk assessments, revisiting training requirements or a combination of all three. You can be confident that we will only provide them with competent LGV drivers, appropriately trained and licensed for the vehicle concerned. These drivers have undergone a full induction course to ensure they always follow safe and environmentally sound operating procedures. Our drivers also attend and complete CPC courses as well as continual learning and development schemes. All drivers are supplied with the appropriate personal protective equipment required by the site. These drivers are fully conversant with the paperwork required by the Duty of Care Regulations relating to the collection, transportation, transfer and disposal of waste. Our paperwork is fully compliant with all current legislation, including record retention periods. Our vehicles have tracking installed and undergo regular maintenance inspections to ensure roadworthiness and all drivers are required to complete a daily defect check. Chairman: R N Cullimore F.Inst.Dir.F.I.Q. Managing Director: M F Cullimore BA (Hons). MA. F.I.Q.